The latest in Gavin Child's Lazercraft brand is the 740 GT Hard Top, which offers a high level of appointment and finish, combined with attractive styling and good performance levels. 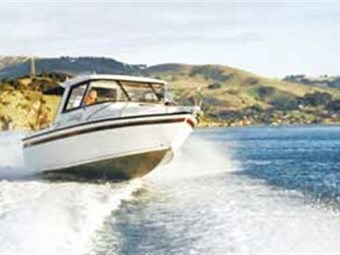 Gavin Child began building aluminium boats in Dunedin under the Lazercraft name in 1984. At that time his main client base was composed of commercial and paua fishermen based in and around Stewart Island. Child's boats soon earned a reputation for strong construction and good seakeeping qualities with owners who were notoriously hard on their gear. As the business began to steadily expand, Child found he was more frequently requiring the use of heavy machinery from local heavy engineering firm, H E Gardner Ltd. In 1990, Gardner's management had already embarked on a policy of diversification and sought to bring their expertise and capital equipment to the boat building industry. It seemed a logical decision to bring Lazercraft into the Gardner fold, with Child as manager of the division. Initially things went well, but by 1998 "the wheels were starting to fall off", with Gardners experiencing financial difficulties in other divisions. The Lazercraft business was offered back to Child who, in partnership with his two sons Jason and Shane, both of whom were also Gardner employees, re-established Lazercraft Marine Ltd retaining some of the existing staff. Shortly afterwards, H E Gardner Ltd folded. At the same time the Dunedin City Council had a number of vacant premises available in the industrial estate in the Anderson's Bay/South Dunedin area. Since the Council wanted to retain and encourage business development in the area, they proved to be supportive landlords of the spacious new premises now occupied by Lazercraft Marine Ltd, which have recently been extended to include a new retail outlet and showroom. The company now employs 13 staff, including the directors, and builds around 50 boats annually, which are sold through 11 dealers nationwide. The company has long favoured the principle of using alloy hulls to which GRP decks are bonded, combining smooth deck lines with rugged hull construction. Hull design cues have evolved since the 1980s, which lend a familial quality to the boats across the range and immediately distinguish them as Lazercrafts. The major alloy hull components are punched from 5083 marine grade aluminium using computer-generated files by outside contractors and are delivered to the Lazercraft factory in kitset form where they are assembled on jigs and welded. The hull bottom plates and transom are 5mm, while the topsides and internals are 3mm. Once welded, the entire underfloor area of the hull is sealed and pressure tested to 3psi to ensure positive buoyancy before removal from the jig and installation of any other componentry. The hulls are frequently built to survey. On completion of hull construction, the GRP decks are then bonded and riveted to the hull. Such is the accuracy of the construction process of the alloy hulls, that fairing prior to painting is not required. The 7.4m long variable deadrise hull design features a 20-degree deadrise at the transom tapering to a fine entry forward. Large, wide turned down chines aft provide stability at rest and then taper forward. Planing strakes are not part of the design nor are they required as the hull rides high and dry. The portafino styled angled transom provides additional buoyancy required for the heavier four-stroke outboard engines that are now gaining in popularity as well as additional storage space and access to the rear of the cockpit. The design is easily adaptable for a variety of power plant options. While stern drive and waterjet applications are certainly possible, large single outboard installations or, as in the case of the test boat, dual four-stroke outboards seem to be the most preferred options. Recommended horsepower is 140-250hp. 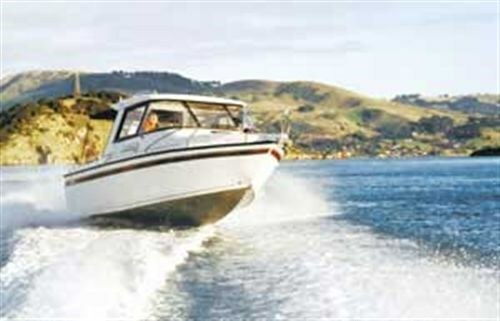 The Lazercraft 740 GT (Glass Top) Hard Top is designed as a multi-purpose recreational sports fishing boat with weekender capabilities for two in comfort. The stylish lines of the hardtop are enhanced by the curved windscreen, while up front the strong alloy fairlead and sweeping, solidly mounted stainless steel bow rails accentuate the distinctive Lazercraft bow sections. The anchor locker can be accessed via the hatch in the forecabin, although this will seldom be necessary as anchoring duties can be easily completed at a touch of the button from the helm activating the Maxwell rope/chain capstan. The forecabin is fully lined throughout and a Weaver hatch provides ventilation and a natural light source. Two full-length vee berths can be converted to an expansive double berth with the use of infills. Two double shelf units run the full length of the cabin and an electric flush toilet is situated under the vee berth to port. Access to the forecabin from the main cabin is easy thanks to the central cutaway of the bulkhead top. A large recessed compartment ahead of the helm station to starboard and the passenger seat to port provides storage for loose items. There is sufficient space atop the helmstation for the bracket mounting of electronic navigation aids, while the dashboard is large enough to accommodate instrumentation and switch controls for the engines. A nice touch is the recessed shelf for the engine remotes. Stainless steel grab rails abound and are strategically placed around the cabin area. Glass sliding side windows can be opened for ventilation on each side. An overhead binnacle provides mounting for the VHF, CD player and speakers, lights and an attractive brass marine analogue clock. The twin bucket seats are adjustable forward/aft; while immediately behind each of these is a padded squab and backrest. On the passenger side, the bucket seat folds forward and the squab can be removed to provide a large, flat bench. SoPac hatches allow access to the cavernous storage beneath the base. Similarly, the helm seat folds around, the squab can be removed and a top lifts up to access a stainless steel sink unit and two burner stove top. Again, SoPac hatches provide access to more storage beneath. Fresh water capacity is 50 litres in an aluminium tank. All upholstery is completed in house and is to a very high standard. On the test boat, the main cabin is separated from the cockpit by a lockable two-piece alloy door that hinges back against twin cockpit seats either side on the rear bulkhead. Each seat has a removable cushion to access storage, which in this case had been customised for dive bottle storage, four bottles per side, while the starboard side also provided gas bottle storage. The practical cockpit area is well tailored for the fishing enthusiast. The chequerplate cockpit sole was supplemented with rolled plastic tubular matting, while four rod holders along the non-slip covered gunnel supplement the stainless steel six rod rocket launcher mounted on the cabin top. There is a wide, full-length shelf along each side of the cockpit and the transom lockers for battery storage are accessed by SoPac hatches. Beneath these are three deep lockers providing even more storage for tackle, bins, ropes, wash down, etc. These are accessed via alloy doors. A double sized Bermuda bait station with its own drain overboard can be easily supplanted by a ski pole if required. The entire cockpit can be protected by a pull-out canopy that can be further enclosed with clear side panels. Access to the non-slip boarding platform by divers and/or skiers is via a stainless steel telescopic boarding ladder. The test boat was rigged with dual 115hp Yamaha four-stroke outboard motors with counter rotating propellers. 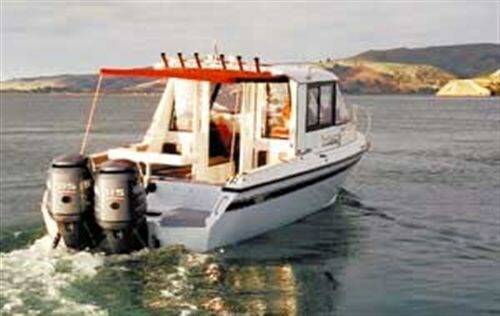 This is a very popular configuration providing a measure of security when boating unforgiving and exposed coastal waters. The engines are extremely smooth, quiet and relatively economical to operate. The standard 180-litre underfloor fuel tank provides a healthy cruising range with one owner reporting 280km on 210 litres. Otago harbour was resplendent as we launched the 740 at the public ramp close to Port Chalmers. The mirror calm harbour provided a picturesque backdrop for our first photo shoot close to Goat Island (Rakiriri). In order to experience the big Lazercraft's blue water capabilities we would have to leave the harbour confines. The boat climbed quickly and effortlessly to plane as we cruised comfortably past Carey's Bay toward the heads. With Aramoana to port and Tairoa Head lighthouse to starboard we were soon playing in a gentle ocean swell. After a few more photos, Child pointed the boat toward the horizon, opened the throttles and quickly had the 740 leaping from one wave to the next. Landings were predictable and although firm, the ride was certainly not harsh. Despite being driven hard into and before the increasing swells, the large expanse of screen remained clear and dry. The boat impressed with its solid feel and no annoying rattles or squeaks. With the cockpit door closed, the almost total absence of engine noise meant conversation remained easy with a pleasant background hiss of water being deflected away from the hull. We found the boat responded quickly to trim from the electrically operated tabs as required due to wind and sea conditions. The hydraulic steering system made helming a similarly effortless affair. The helm was comfortable either seated or standing with ample foot and elbow room. Visibility through the curved screen was also excellent. While we were unable to take accurate performance figures, the twin Yamahas endow the 740 with more than adequate performance levels with 78kph showing on the speedometer at wide open throttle. The rig was able to easily achieve plane with just one engine and then sustain a comfortable 40kph cruise and a maximum speed of 50kph that provides a significant measure of reassurance when out at sea. One aspect of the boat's performance that impressed was the transition from displacement to plane, which was very smooth, and the way the boat would hold plane at low to moderate speeds. We came away from our time on the water in the 740 GT Hardtop with our initial impressions reaffirmed - that this is a well-designed boat that offers a high level of appointment and finish, combined with attractive styling and good performance levels. Most Lazercraft boats are supplied ex-factory on custom-built Nyalic-coated alloy trailers. The 740 GT is supplied on a tandem axle, four-wheel disc-braked trailer that also proved easy to tow behind our medium-sized Japanese four-wheel-drive vehicles with an overall towing weight of just over 2200kg. Trailer: 5083 marine grade alloy, Nyalic coated, tandem axle, 4-wheel disc brakes, stainless steel calipers standard, nylon rollers.